When we were young, most of us heard that you should avoid talking about politics and religion in polite company. I believe the days of staying silent about the things we care about are over. With respect and an open mind we learn from talking to people and if we're lucky we come to new ideas and new ways to see the world and make it a better place. This campaign blog is a step to start conversation based on feedback I've been hearing at events and while canvassing in Riverside and Barrington, as well as an effort to touch on some of the many events going on around us. Please check in and read it from time to time as we head into the elections. 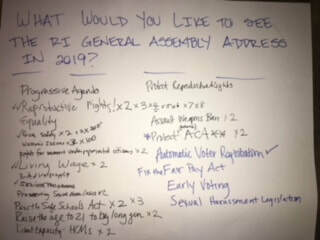 At our recent Summer Kick-off event we asked attendees to tell us what the issues are that are influencing their votes in 2018 and to tell us what they would like to see the Rhode Island General Assembly address in 2019. We gave folks a Sharpee and asked them to transcribed their answers and below you can see pictures the original poster boards from the event. I was THRILLED to read what people had to say and I'm grateful to everyone who picked up a pen that night. It helps me to know what is on the mind of voters. Where you see a * or +1, etc, or (checked), indicates where someone came to write something but wanted to agree with a topic that was already listed. I've done my best to transcribe the posters which you can see below. 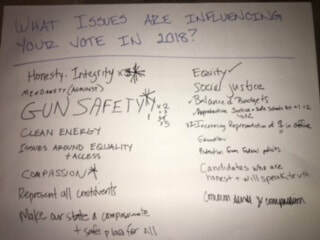 What issues are influencing your vote in 2018? Some of the issues are concrete and others speak to the culture of governing and how we want our state to function - all are critical conversations for us to have. There may not be time before the September 12th RI Democratic Primary to hit all of the topics in the blog, but all of them are truly relevant and reflect the priorities of many voters I talk to. Let's be sure to talk about politics in polite company and everywhere until we make the world a better place.